Some of the most spectacular displays of wildflowers in Southern California can be seen in the desert. The wildflower season, in such places as Palm Springs and Death Valley, begins in the lowest elevations in February and extends into early summer in the mountains. Here’s your guide to the best places to see wildflowers in the California desert. Winter showers brings spring flowers to the Anza Borrego Desert State Park when there are slow-moving storms that hang over the desert for several days, including overcast skies, cool temperatures, and light or little wind. 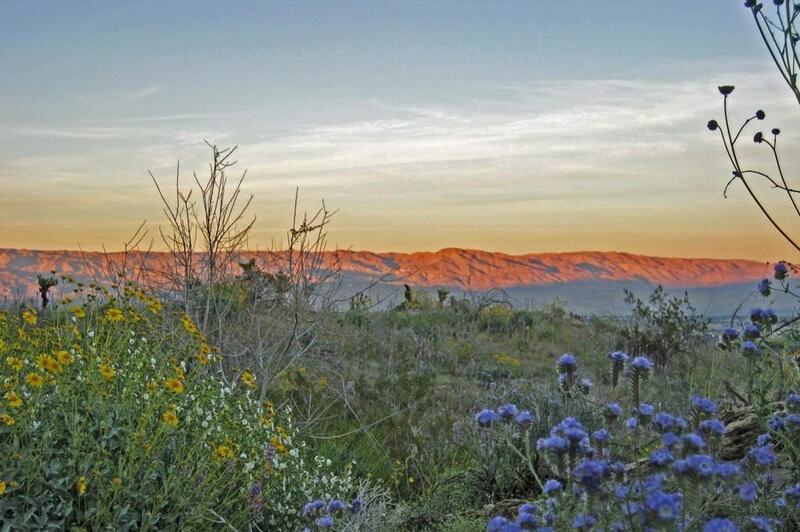 Plan your visit to observe the wildflowers in Borrego Springs between February and April. Here you will see various species including Parish’s Poppy, Hairy Desert-Sunflower, Desert Lily, Sand Verbena, Dune Evening Primrose, Indigo Bush and others. Between Febrary and April, the desert comes alive with the vibrancy of spring as the wildflowers bloom and transform the Coachella Valley into a colorful canvas. The best place to celebrate the wildflower season is at the Coachella Valley Wildflower Festival, which is held in March every year at the Santa Rosa & San Jacinto Mountains National Monument Visitor Center in Palm Desert. 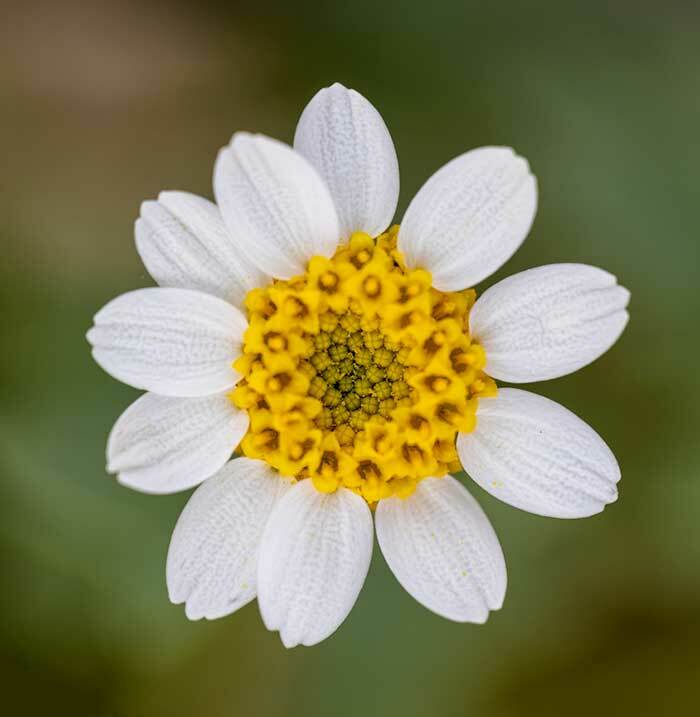 The best time to see wildflowers at the Coachella Valley Preserve – Thousand Palms Oasis Preserve is in the spring, between February and April. This delightful haven has no user fees, though donations are greatly appreciated. You can also picnicking, hiking and visiting the rustic visitor center called the Palm House. Death Valley is famous for its spectacular, spring wildflower displays, but those are the exception, not the rule. Only under perfect conditions does the desert fill with a sea of gold, purple, pink or white flowers. Wildflowers tend to bloom in Death Valley between February and July. Particularly during a super bloom, you will see spectacular views of Brown-eyed evening primrose, Purple sand verbena, Desert five-spots, Gravel ghost and Desert gold, among others. A drive to Joshua Tree is the best way to see a lot of different wildflowers at various elevations from the high desert to the desert floor. It’s ideal because the wildflowers grow right up to the road’s edge there. Wildflowers begin blooming in the lower elevations of the Pinto Basin and along the park’s south boundary in February and at higher elevations in March and April. Desert regions above 5,000 feet may have plants blooming as late as June. Devote an entire day to this adventure by starting at the park entrance on Hwy 62 in the town of Joshua Tree and follow the main road through the entire park, which connects to Highway 10 on the low end. There are plenty of areas to stop and picnic or to take mini hikes in areas of really high density wildflower stands. Each elevation of the park supports a slightly different palette of plants and some feature one dominant species in an incredibly massive show. Park staff and volunteers compile their wildflower observations weekly during the spring season to produce a list of the wildflowers that are currently in bloom and where you can see them. Rising abruptly from the desert floor, the Santa Rosa and San Jacinto Mountains National Monument reaches an elevation of 10,834 feet. Providing a picturesque backdrop to local communities, visitors can enjoy magnificent palm oases, snow-capped mountains, a national scenic trail, and wilderness areas. The Monument includes two Federal wilderness areas — the Santa Rosa and the San Jacinto. Although this is a very interesting area to view from the car, the best way to see it is to hike the trails or visit the high country by way of the Palm Springs Aerial Tramway (in Chino Canyon off of Highway 111). The Tahquitz Canyon Trail is a trail which leads to Tahquitz Falls and back. The 2-mile, round-trip hike follows a creek into the canyon which leads to a 60-foot waterfall. You must have good balance and be able to climb up and down rock steps that may be as high as 12 – 15 inches. This canyon has very little shade, no restroom facilities, and no water fountains. Along the trail, you’ll encounter native plants and wildlife. Bright red chuparosa bushes spot the landscape and there are splashes of yellow brittlebush mixed in among the rocks and shrubs. The best displays usually appear in late March and early April. The Indian Canyons are located on the Agua Caliente Indian Reservation at the end of South Palm Canyon Dr. in Palm Springs. There is a tollgate at the canyon entrance where you pay for admission. 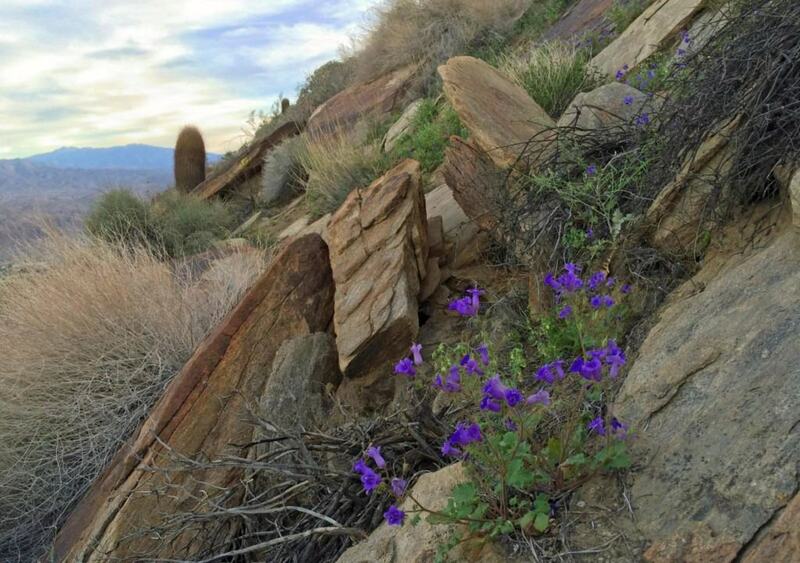 April is the perfect month to hike the desert trails, as the weather is still cool and the blooming wildflowers highlight the desert landscape, creating an artists’ palette.